“Create a micro:bit web server via AT commands which can respond to web browser requests over WiFi. 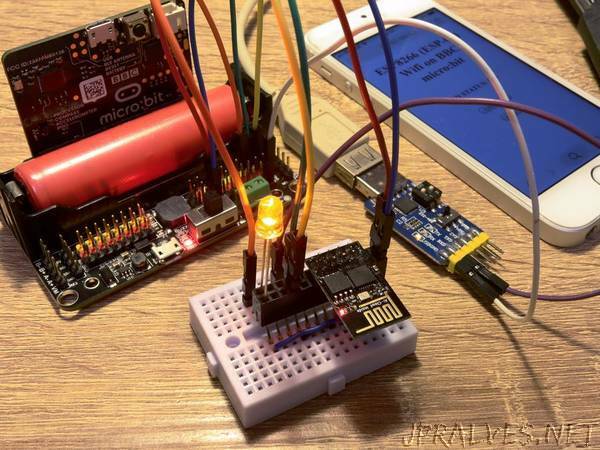 The project allows you to control your BBC micro:bit via WiFi, by using a cheap ESP-01 (ESP8266) module. The micro:bit would generate an HTML web page for the user with control buttons on it. The web page can be accessed from your computer or smartphone without using any apps. The micro:bit talks to the ESP-01 via AT commands, to set up a web server in either station or AP mode. These commands are in the factory firmware of ESP-01s. You can view the code here or copy the attachment in this article.